Ireland, It's Okay To Be Yourself - Are You Finished Yet? I haven’t been giving my blog much love lately. And the fact that many of the blogs I follow have been all up in my inbox recently, posting multiple times a week (some even being brave enough to tackle the “Blog Every Day in May” challenge), has made me feel a scosche inadequate. I really have no excuse…except that I was away, traveling in Ireland. That is so a good excuse. Scratching Ireland off of my bucket list was exhilarating. Only I have already added it back onto my bucket list, because a week was not enough time to properly spend there, to see all I wanted to see. Just like Lucky Charms, Ireland really is magically delicious. I feel like I ate a whole bowl of it, but now I want to go back and pick out all the marshmallows left behind in the box. Ireland has to be one of the most breathtakingly gorgeous countries of the world. Raw yet refined natural landscapes meld with remnants of past civilizations and a national pride born out of respect for both history and the God-given beauty bestowed upon them. The Irish don’t simply tear down what is old to begin anew; they either maintain it for posterity with diligence and attention to detail, or simply let the impression that remains exist among what continues to thrive and grow. My husband, who works for a window manufacturer, marveled at the quality of workmanship in the homes we saw that had to have housed generations upon generations. And as we drove across the country, it became a sort of game to call out “Random Castle!” every time we saw a ruin amidst a neighborhood of houses or atop a small hill, surrounded by green pastures…or next to a petrol station. Yet there was one thing missing as we traversed the Technicolor green landscapes, populated with sheep, cows, and rainbow painted cottages. There we were, feeling very “local” driving on the opposite side of the road and the opposite side of the car, taking in the beauty of Ireland. All we needed was some good Irish music to complete the mood. I turned on the radio, and out comes one of Rhianna’s crappy monotone songs. Yeah, no. Next station: Nickelback. Next station: “Total Eclipse of the Heart.” Seriously? Is there not ONE station in Ireland that plays local music? The answer is no. Their radio waves are pretty well dominated by American music. Well, that kind of killed the mood. So we listened to Mumford & Sons on my husband’s phone. Okay, so technically Mumford & Sons is from London. But same side of the pond. I’m counting it. 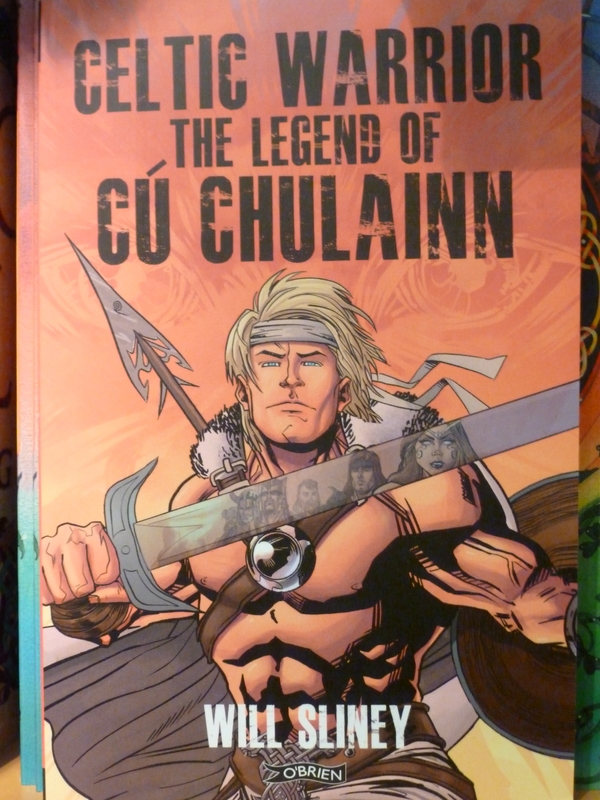 Correct me if I am wrong, but I believe the Irish are trying to pass off their own versions of He-Man and Gene Simmons. It’s so blatant, it’s not even funny. American style. 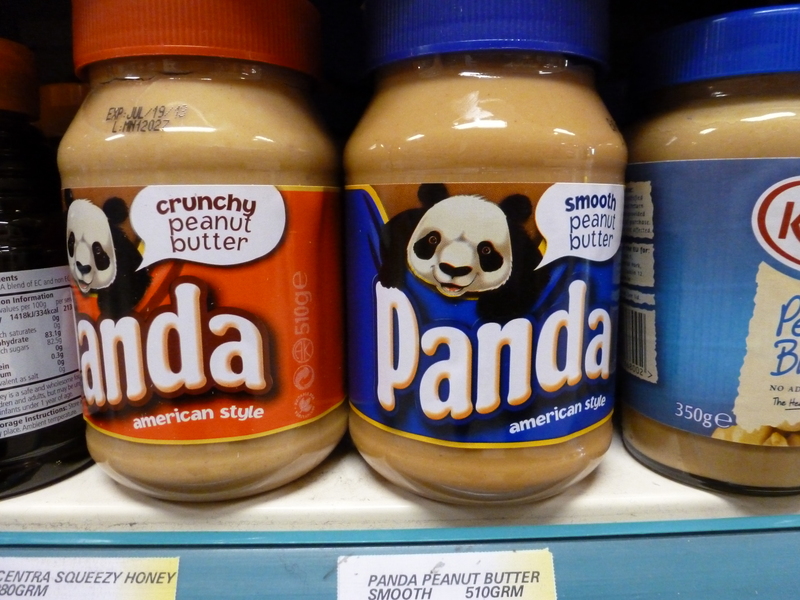 I am not an expert on pandas, but they don’t strike me as having talent to make peanut butter. Now Peter Pan, he’s got mad skills. I think I’m going to trust the flavor palate of the guy who undoubtedly has a permanent case of pixie dust induced munchies over an animal whose ideal snack is bamboo. I’ll call the panda when I need new wood floors. Take a good look. Does that charicature look familiar? I thought it did as the cashier handed it to me, but I quickly brushed the thought aside. I mean, it couldn’t be. Why WOULD it be? It just doesn’t make any sense for it to be. So we walked around the town a bit. But I just couldn’t let it go. I examined the bag more closely, trying to read the words that were printed backwards. Winning…I got tiger blood man. Holy O’Guiness! 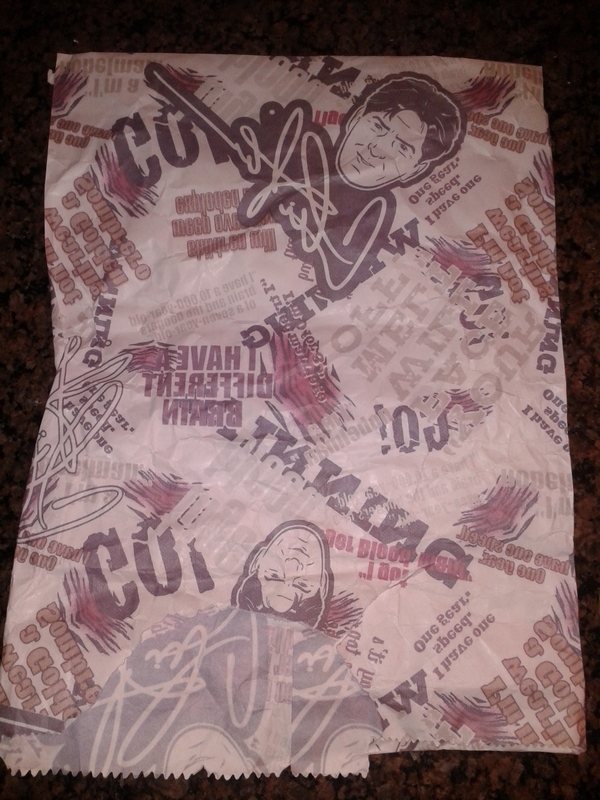 It was, in fact, CHARLIE SHEEN on my gift bag…from a tiny souvenir shop…in a small little town…in Ireland. Well, I just couldn’t let this go, so we went back to the shop. I had to get to the bottom of this. I very politely asked the cashier why in the world she had Charlie Sheen on her bags. She immediately laughed and said I was the second person that day to ask her about it. And frankly, she had no idea why. She didn’t even know who Charlie Sheen was. When she found out that he was Martin Sheen’s son, she did tell us that the Irish LOVE Martin Sheen. They are always giving him awards. I laughed and broke the news to her that Charlie is, well, kind of a horrible person. She laughed so hard, and decided that maybe she should stop using the bags, in case it might offend anyone. But she planned to use it at the smoke shop she owned down the street. According to her, “we’re a bit politically incorrect down there anyway.” Honestly, it was one of the best parts of the trip. But the whole thing begged the question: Ireland, why do you feel the need to assimilate so much of American culture into your own? And if you are going to continue, at least import the good stuff. I mean, it was a little disconcerting to hear “Regulators” by Warren G on the Galway Bay ferry ride over to the Aran Islands, which hold close to traditional Irish culture, still primarily speak Irish Gaelic, and only recently installed one ATM at the small grocery store on the largest island, Inishmore. 1. 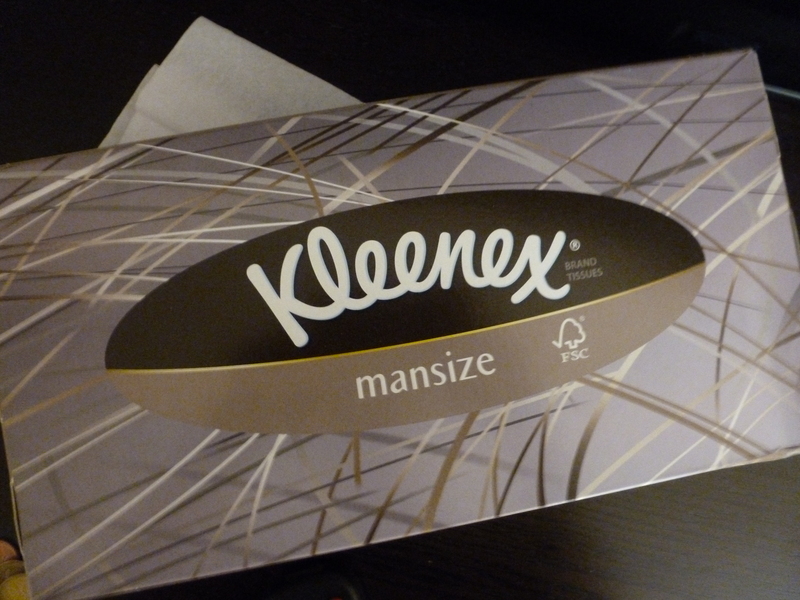 Mansize Kleenex. They were enormous. And if you could realize how many Kleenex we go through at my house, thanks to my husband and his fog-horn nose blowing, you would understand why this was such a big deal. 2. 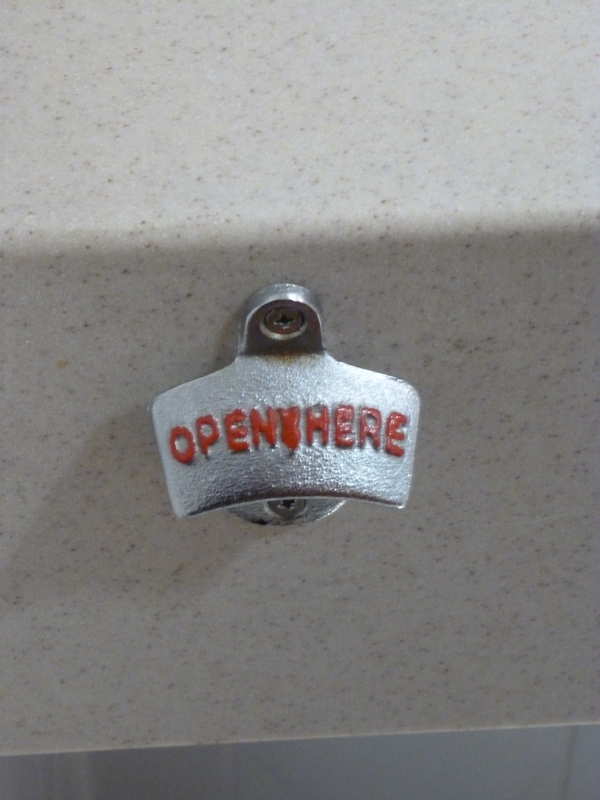 Bottle Openers in the Bathroom. I kid you not. This picture was taken in the bathroom of our hotel in Dublin. The Irish really do drink beer anywhere. Cheers. 3. 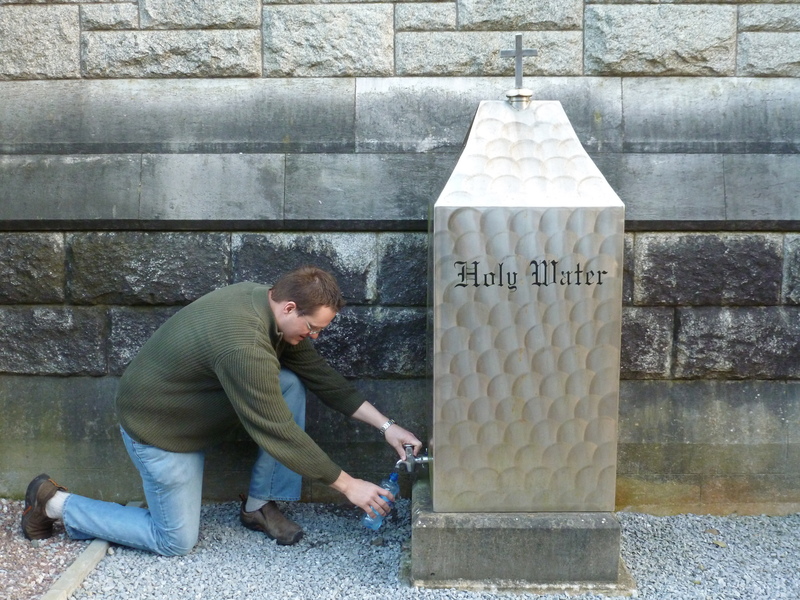 Public Holy Water Fountains. Because sometimes waiting for a priest to do an exorcism just won’t do. 4. Gaelic Football. It’s not soccer. It’s not rugby. It’s not football. My best guess is that it’s like those games you played as a kid where everyone made the rules up as you went along. Now it’s okay to touch the ball with your hands…You can run with it, but only if two people are chasing you…First you have to kick it, then catch it, then pass it…You can score by getting a goal, or by getting it through two poles…Seriously. We went to one of these games, and couldn’t figure it out for the life of us. But I still can’t figure out American football, and Gaelic football players wear tight shorts. I vote for Gaelic football. 5. Cute Old Men Strolling/Riding Bikes/Walking Dogs. These guy are everywhere in Ireland. Everywhere. And one thing you might not know about me is that I am a tad obsessed with cute old men, especially if they are riding bikes, walking dogs, or strolling in little Irish tweed caps. 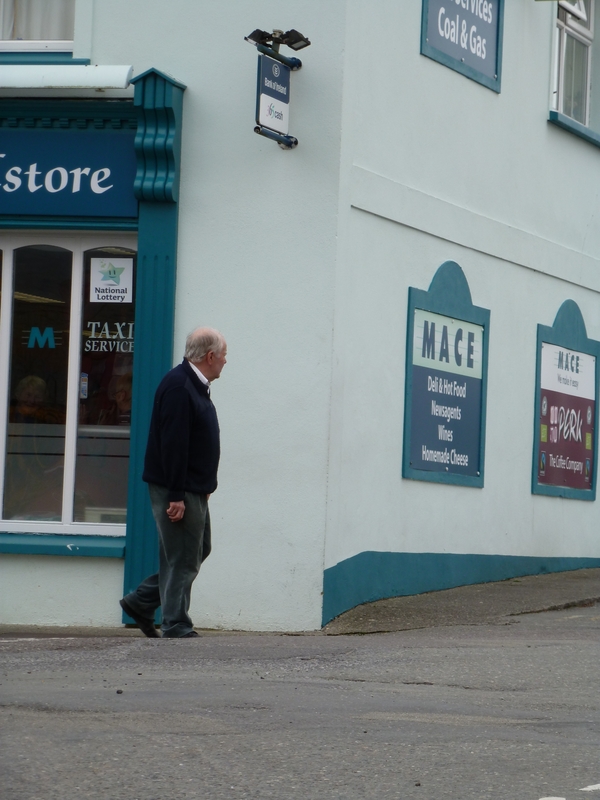 All I wanted was to take one photo of a cute old man in Ireland, but I just couldn’t find the right moment…mostly because said old men would have totally seen me taking a random picture of them, and then I would feel like a weird creeper. The above photo was my one chance of going unnoticed. This cute old guy was walking his dog, who wasn’t on a leash. It was perfect. But just as I went to snap the photo, the dog shot ahead into the street and almost got hit by a car. Happy ending for the dog (since the car stopped in time), but sad ending for me, who only got this picture of a cute old guy thinking he’s about to see his dog meet an untimely death. I will say that it was partly worth it to hear him properly scold the dog afterwards with his jaunty Irish accent…and dropping f-bombs like nobody’s business. But I move that we need more of these cute old men on the streets of America. Here, they are all behind the wheels of cars, decreasing the cuteness factor, as well as the safety for all drivers in the vicinity. I may try to start an organization that works to put new shiny bikes in the hands of cute old men everywhere. It would be a step closer to my utopia. Other than that, I really think Ireland is just fine being itself. It is a country rich in history with unparellelled beauty. I hope to return someday. But next time I will know to bring my own Irish music from home. I just loved this post as I too love Ireland and all it entails. Thank you so much for the wonderful pictures and the laugh at the fog horn nose. We have one in this house too. Oh, the nose is out of control! Mostly I have become used to it and barely notice when he does it in the house. But while we were on our trip, he had a bad cold, so the nose blowing was super-charged. I should have kept track of how many euros we spent on Kleenex. We go through the same thing here. I laugh at him because he blows his honker as soon as he wakes up then brushes his teeth and blows again,then goes downstairs and heads to the bathroom to,you guessed it,blow his freaken nose. 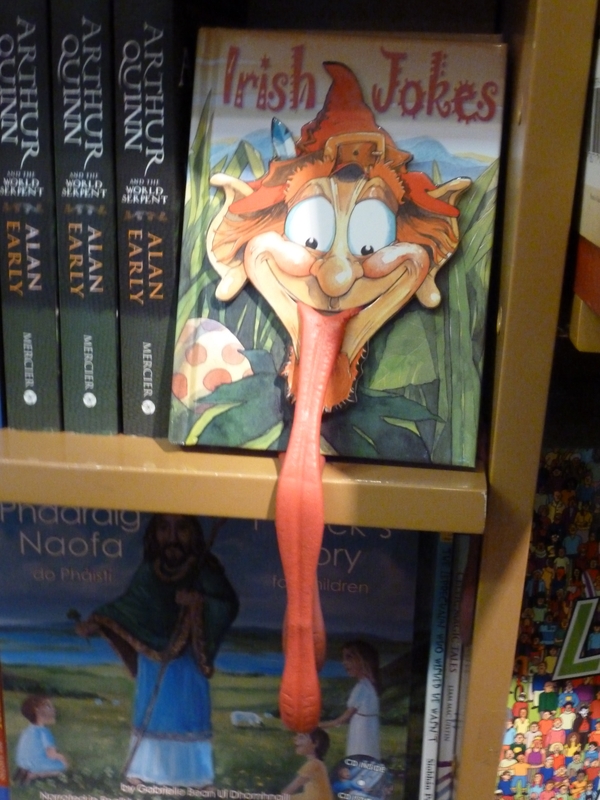 But enough about horn blowin, I really did love this post about Ireland and don’t want to take anything away from it with my husbands large Hungarian running nose! Ha! Thanks. I’m glad you enjoyed it! Now you have me even more excited to go to Ireland! I’ll explore what America pop culture references I find and share them with you. When you have a chance, if you have any places you think we must go, let me know! I will send some notes to you! But my biggest advice is to spend more time in the smaller towns and less in the bigger towns. Cities like Dublin and Killarney are cool, but when all is said and done, they are big cities much like any other. You get a better taste of traditional culture in places like Cobh and Kilkenny. And I would highly recommend the Aran Islands. Stay there overnight if you can. 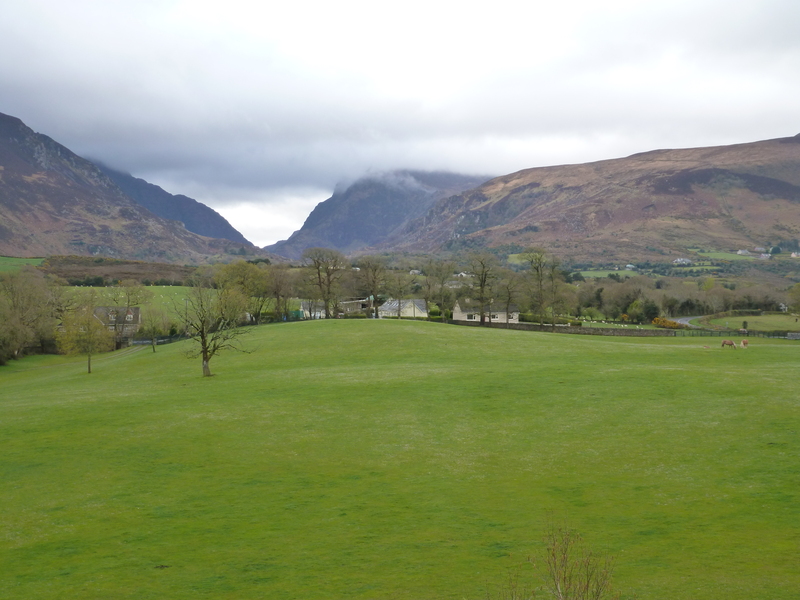 We stayed at Man Aran B&B, and it was my favorite place we stayed. Cracking up at so many things, but what really got me was the peanut butter! Thanks! I should have bought some just to see how “American style” it was. I love this! Your take on travel writing is so fun. Can we start a kickstarter campaign to fund more travel adventures for you? And don’t think the preservation shout-out went unnoticed! Yeah! Kickstarter! I would be down for that! And I thought of you so many times on the trip. I have been trying to get my photos in order and have been excited for you to see them. 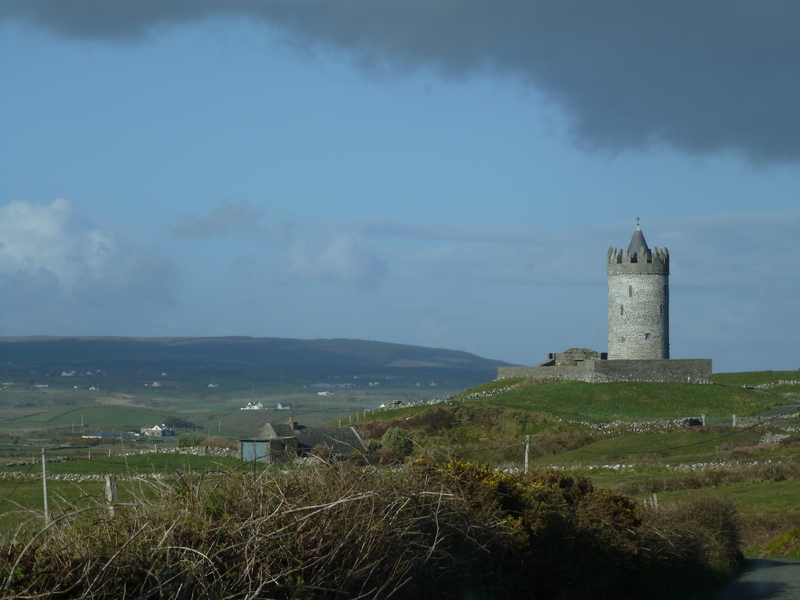 Ireland is a preservationist’s wonderland! I want to “like” or “+1” that!! Now I REALLY want to go!! It was the cute old men, wasn’t it? You will get there! That was part of it. Did you see any that looked like Grandpa with his cap on? They all looked like grandpa 🙂 I did take a pic of a store window full of Irish tweed hats because it made me think of him! Please take me along with you if and when you come back because your commentary was hilarious and excellent. It’s just what I need to get the most out of a country! Well, thank you! It’s nice to find the funny everywhere…it’s the common denominator. Apparently right along with Warren G.
When I lived in Topeka and we didn’t have cable, the PBS over-the-air station actually had three stations (hooray, digital airwaves). On the second channel they frequently showed Aussie Rules football (total badassery) as well as Gaelic sports—Gaelic football and something called hurling (not quite lacrosse and not quite field hockey, but totally freaking awesome). If you liked Gaelic football, you should definitely check out hurling. I could seriously watch those all day. I’m down with importing that here. Finally, I’m down for going with you and Emily. When do we leave? We actually would have loved to see a hurling game, but there wasn’t one going on while we were there…at least not one we could track down. For a moment we considered bringing back hurling sticks for the kids as souvenirs. Then we realized they already had a multitude of sports equipment at home to use as weapons, and we could save 35 euros. Thanks for the Irish music suggestions! Where were you a few weeks ago? We did end up finally find a pub where some great local musicians were playing. As is the rule, we had a pint of Guiness and were chatted up by a drunk old Irishman who told us, “I’m here too much. Way too much. If I didn’t show up one night, they’d all say, ‘he’s f*ckin’ dead. '” It literally completed me when that happened. Thanks. Let’s get a whole tour bus together and head over. We could call it “The Rowdy Wagon.” And you are correct about that athlete stuff. Whew! It was brutal! Those guys take a beating and still move that ball down the field like it’s nothing. Abercrombie’s CEO Doesn’t Bother Me…But His Cologne Still Does | Are You Finished Yet? Turkey Tetrazzini With a Side of Dementia | Are You Finished Yet? If You Wanna Get With Me, Put Away the “Just For Men” | Are You Finished Yet?